Camille was adopted into a loving bunny home! She is the new companion for a boy bunny who lost his bonded mate some time ago. Camille has been spayed, and she is now fully prepared to be a super spoiled and loved house bunny! Thank you to everyone who sent financial and emotional support to little Camille, she was worth it! Hi everyone out there who loves me! It's me, Camille. As you can see in my picture, my fur is growing over my owie and now you can hardly tell I had a big injury there at all! I am still taking my Baytril a couple of times a day, I think it tastes really good. Auntie Linda says I still have a few more days of that to go until I'm all done. My skin feels pretty smooth now and I don't have any weird bumps there on my shoulder like i used to. My skin has grown back too! I guess I'm almost all better!! I still like my snuggle safe and I make Auntie Linda heat it up for me at least a couple of times a day. As soon as she puts it in under my pink fleece bed (that the nice lady named Karen sent me), boom, I'm laying all over it. Auntie says I'm supposed to have "outgrown" the extra heater by now, but I say no no no!! It feels super nice on my tummy when I lay on it so I am still using it lots. I've been digging up all my blankies, I make nice pretty piles out of them. It's my favorite thing to do right now! I also like to chew on paper and throw things, but fixing my blankies is the most fun. I am very very happy that all the yucky stuff is over. My arm still feels strange but it does not hurt me anymore. I didn't like the shots and the flushing of my injuries one bit! But my Auntie Linda is a nurse and she says it has to be this way for now but not much longer! Yippee! I still insist that I get held for a long time, and I stay very quiet as long as she is holding me. But when I've got my feet on the ground, look out! I'm off and running! I'm a very busy bun, you know, all those blankies waiting for me...to organize.... wheeee! PS: I Love my foster mom, Auntie Linda, she saved my life! It is the end of April and I am a big girl now! I am getting better and better every day. Soon I may be able to get a home of my own! Auntie Linda took me to visit Dr. O'Day this week. She was really happy to see me! She thought I looked even more gorgeous than before (is that even possible?!). She said she couldn't believe how wonderful my owie looks! My fur had grown back quite a bit, but Dr. O'Day shaved me so she could really look at my owies. She poked me a few times (it hurt, but Auntie Linda said I was very brave). I still need to take my Baytril for two more weeks, but that's okay because I really like the taste of it! No more flushing, woohoo!! And I don't have to go to Dr. O'Day or Dr. Harvey anymore, unless my owie gets worse or something. Auntie Linda lets me run all over the table every day, or else I run in the hallway or on the daybed. Auntie says I have to use my arms a lot to keep them working right. I really love to explore everything and the Yorkies hardly even notice me anymore. I do *tons* of binkies and I have an awfully good time. I hardly notice my owie anymore when I am running. Dr. O'Day tested both of my arms and said they are both doing really terrific. She was amazed at how well my owies have healed and said I must have a strong immune system. My foster mom calls me poopies (what is that???) and then I run over really fast and put my head down so I can get kisses on top of my head. It's the best! I'm enjoying eating all my hay, pellets and veggies. I get veggies twice a day and I love all my food. I especially like it when Auntie feeds me my greens, it tastes soooo much better when mama feeds them to me! I'm doing just fine fine fine! I'm lovin' life and I'm so happy that I got rescued. Auntie Linda says I'm a very lucky bunny and I sure do believe that! Camille's condition continues to improve. She continues to gain weight, and she is now up to a pound and a half! The round baby bunny silhouette is starting to leave and her face and back legs are elongating. Camille is getting stronger every day and is also getting fast on her feet. A very active girl who loves to explore, but also wants lots of cuddles. Her nurse Linda feels that Camille is still feeling the effects of being all alone in the wild before she came to The Haven and she still needs reassurance that she is safe. The injuries to Camille's shoulder are much better. She still has three small puncture wounds that require twice daily flushing. 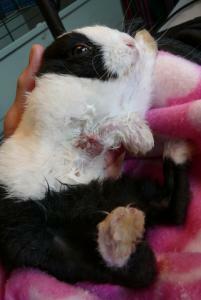 The wounds are oozing a small amount of pus now and we hope that the pus will stop completely soon. Camille has an appointment with Dr. O'Day on April 23, and we hope that her visit goes well. Camille eagerly accepts parsley and lettuce, and continues to devour her hay and pellets. She is slowly changing her diet from that of a baby to the diet of an older bunny. She has begun using a litterbox, and is trying to learn about it. Watch for additional updates on Camille on this website. We at The Haven appreciate all of the support that people have provided for tiny Camille, and we hope that her story is a lesson to those who might dump their rabbit companion in the wild to fend for itself. Here is a note from Camille. Hi everyone, it's me, Camille. I keep gaining weight because I'm eating so much, yum-yum. Linda says I'm getting cuter every single day which is hard to believe since I was so very perfect when I was born...I think I am sort of cute!!! Hee hee. I think I was a kangaroo in a past life. Every time Linda flushes my owie I have to clean all my fur and my arm and I like to stand up on my back legs to do that. I mostly hold my wrist straight now, she doesn't have to remind me very often anymore. My owies are getting better too and they don't hurt so much anymore. Of course I'm still getting my Baytril, my Buprenex pain medications, and the warm packs on my owies (I don't like sitting still for those, I want to go explore, it's *boring* waiting for it to be over. harumph!). Oh yeah, and that white cream SSD stuff on my ear owie. My own Linda stopped giving me my Gentamicin eye drops and my subq fluids as of yesterday! Yeah not too many needle sticks!!! Today my eyes are bright and shiny and I'm not dehydrated! So I am very much continuing to heal from my kitty attack (boo hiss to the kitty). I got this wonderful present from someone named KC at Harvest Home...Linda says she's one of my special guardian angels out in the world who are praying for my recovery and she sent me toys and stuff. Wheeee, this is fun. I guess I have lots of aunties and uncles that I don't know about! Linda took this picture of me with my new goodies. Just yesterday she was talking to Auntie Heather about giving me some toys and -- voila! -- I get this really neat stuff in the mail. Is that kismet or what?! I wrote this note to Auntie heather to put on the website so I could thank all my guardian angels (some as far away as The Netherlands!!!) out there in bunnyland for all their healing thoughts for me. I feel them, and I know that is why I am doing so well. Special thank yous for those who are helping with my owie bills, I know that I'm already a pretty expensive bun (and worth every penny, if I do say so myself!). I really do appreciate all that everyone is doing for lil ol' me. I feel so safe and so loved now. Here is the latest report from Camille's caretaker and nurse Linda, from our Santa Cruz medical site on Friday morning, March 30, 2007. Camille weighed 439 grams today, up 19 grams. She continues to heal and her wounds are looking better. Her shoulder is less edematous and I am not getting any pus out when I flush her wounds (which she is tolerating much better). I will of course continue to flush twice a day. I warm pack her after she gets her Buprenex and KMR, and before I flush her wounds. Tonight she wasn't very cooperative with her hot packing, she was all wiggly and restless, so I take this as a good sign! I think she is gaining strength. During her floor time today I noticed that she took a few steps with both of her front paws on the floor! Yee-Haw! She didn't put much weight on the right paw but I did see her take 3 or 4 steps with it. She can move it and I'm very optimistic that someday she will regain full function. She is holding her wrist straighter now on her own, I don't have to position it as much as yesterday. All in all I do see progress and I do see signs that the functionality in that right arm might be able to be restored. Camille continues along the right path. I am very pleased! I am also breathing a huge sigh of relief, I think she is past the really dangerous phase so I don't have to worry so much about her. I will still watch her like a hawk, but I think she is much more stable now. Camille is spending much of her time with her guardian angel, Linda. The tiny girl is fond of laying curled up against Linda's neck and shoulders, and putting her sore leg up on Linda to keep it elevated. She often falls asleep in this position. She is eating really well now, taking hay and water on her own as well as continuing to be hand fed KMR. Camille has taken some tentative steps and tries to put weight on her bad leg for a few short steps. The leg remains very stiff and tender, but she is able to move it a little now, so we are hopeful that she will regain mobility in that leg. Linda continues to provide around the clock care for the little girl, but she is a fighter, and we are all hopeful that she will fully recover. Check back here for more updates. Baby Camille is getting stronger every day. Linda, at the Santa Cruz main medical site, is giving her LRS, KMR, antibiotics and pain meds. Camille is eating hay and pellets and she is drinking water too! She likes company when she eats and to be held after her meds. It's a full time job caring for this little girl! Of course she has to have her wounds flushed two time each day, and comfy warm packs to help her heal and feel better. She is so sweet. The infection is still active but she is the healing phase. Most, but not all, of the infected material was removed, but each day is a new battle. Linda, her nurse reports that her leg and front paw is a bit more flexible. She is moving around and trying to walk on her bad leg - then she takes nice long healing naps. Thank you so much for all your get well wishes. Tiny Camille continues to recuperate with her personal angel, Linda, providing around the clock care. Today Camille is trying to recover from the extensive surgery that she underwent yesterday. Special kudos are in order for Linda, who has been the life saving champion for Camille from the first day she arrived into our care. Linda quickly recognized the severity of the baby's injuries when she was brought to us. Linda then scrambled to find a vet nearby to help stabilize Camille. Baby Camille was cold and hypoglycemic. Linda worked with other volunteers to provide warming, feeding and care until we could get her into the vet. Then Linda continued to fight for Camille's life. She worked with the first vet to manage the first day of care, assisted in figuring out medications, and provided supportive medical care. She made sure that the baby got everything she needed including X-Rays, proper medications, and around the clock care. We are so fortunate to have such a qualified, highly skilled nurse working with our severely injured bunnies. Linda is just amazing. Thanks also to Sioux for driving like crazy to get baby Camille into see the vet while Linda administered to her medical needs. What an amazing team. Melanie helped to feed, Stefan kept warming materials coming and Linda provided direct medical care. Linda has been providing the post Vet supportive care at her site in Santa Cruz. After two days of intensive, critical medical care, Linda took Camille to a second Vet that could evaluate the injuries and possible perform surgery. She drove two hours to get this accomplished. Linda was also instrumental in getting Camille all the medical support she required. She made sure the baby had all the proper care, waiting with her for hours, assisting at the vets office, and providing all her follow up care. Linda operates the main medical site of Rabbit Haven. As it turned out Camille's surgery and vet visit ran from 5PM until after 9 PM That was truly a labor of bunny Love! I know that Camille is very appreciative. Camille is alive in large part due to Linda's quick action, sharp diagnostic and observation skills and for all her compassionate nursing care. Our tiny angel is in the best hands. Linda's last report came in at 4 AM Tuesday morning - another report will come in soon. Watch for updates. Love to little Camille and many thanks to Linda for this high quality care. The vet and nurse reported to Auntie Heather at 9:45 tonight. Camille's surgery to cleanse her severe bite wounds in her damaged leg took much longer than we anticipated. She was in surgery almost one hour, under anesthesia the whole time. Camille is such a fighter! Her Oxygen levels stayed good throughout her surgery now she will remain with our nurse for the night with critical care. The lengthy procedure was required due to the extensive infected areas in her shoulder, neck lymph system and leg. Additional bite wounds were found on her neck and shoulder. More X-rays were taken and her tiny bones are not broken. There are no signs of bite wounds in the bones. Dr. O'day worked overtime from 7:15 until almost 9:00 to save her - So far Camille is hanging on. She rode back to our med site in Santa Cruz with our nurse, Linda, for additional care. Camille's terribly swollen shoulder and leg areas are now completely shaven and relatively free of pus. Hopefully, the procedure took a lot of pressure off her leg nerve, and relieved her body of foreign matter. She is on great pain meds now and antibiotics. Oxygen support will be provided as needed. The bite wounds are still inflamed but she is medicated and hopefully not feeling too much pain. The doctor was stunned to see so much infected material coming from all her wounds. She returns to the vet in two days for follow up care. She still has good response in her tiny right foot. This is a good sign. Please send get well wishes to this little angel girl, Camille. We will have more pictures and an update soon. Thank you everyone who has written to me to share your good wishes for tiny Camille. While we were in the middle of a hectic and crowded bunny adoption show, Auntie Heather received a call around noon from a frantic person who had found a tiny baby bunny that was seriously injured. This adorable Dutch baby was found abandoned in the caller's back yard, and the baby bunny was in shock and unable to move. 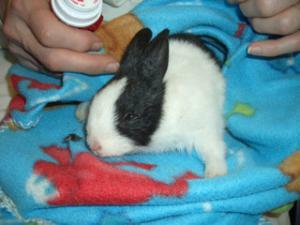 The bunny is very lucky that this person found her just in time and saved her. We estimate that the baby had hours to live without treatment. The person who found her located our number as she had just picked up the debut edition of Silicon Valley Tails at a nearby shop. Our big blue ad on the back page caught her attention. This good Samaritan had no idea what to do or where to take her new found patient, so she called for our help. We referred her to nearby vets and quickly discovered that none of the doctors was able to see the baby. The person who found the baby considered the shelter, however there was no vet on duty so it would have been unlikely that the baby would have been seen that day. After some discussion, it was decided that the baby would be brought to The Haven. The baby is about 3-4- weeks old and cannot use her front leg as it is completely infected and too swollen to move. She has several apparent cat or some other animal bites around her leg and on her ears. She was near death from shock, special thanks to the caring family that brought her all the way to The Haven to get her medical support & rescue. The baby arrived in a small plastic tub, kept warm as requested. On arrival our foster mom Melanie fed her warmed KMR and warmed her - she was very cold and in shock. After treating her for shock, she was checked for injuries. She had several. As we looked at her ear injuries part of her ear actually fell off. It had been bitten so deeply that it was severed. Then she was taken by our nurse and volunteer driver to the first emergency vet close by that was able to treat exotics. Camille, as she was nicknamed, was taken to Dr. Riles for emergency care. She was examined, x rayed and given supportive care. Camille is now receiving critical care support at our primary medical site in Santa Cruz. She has suffered such horrific injuries, the vet was not able to conduct a full examination, The tiny baby was too ill and the vet recommended rest, treatment for shock, fluids, pain medications and antibiotics. In a few days when her condition stabilizes, the leg injuries can be addressed. If you would like to help contribute to Camille's care, please use our PayPal account and put her name in the comments section, or donate by check.